Halle Hollatz awaits the pitch. Vermillion, S.D. 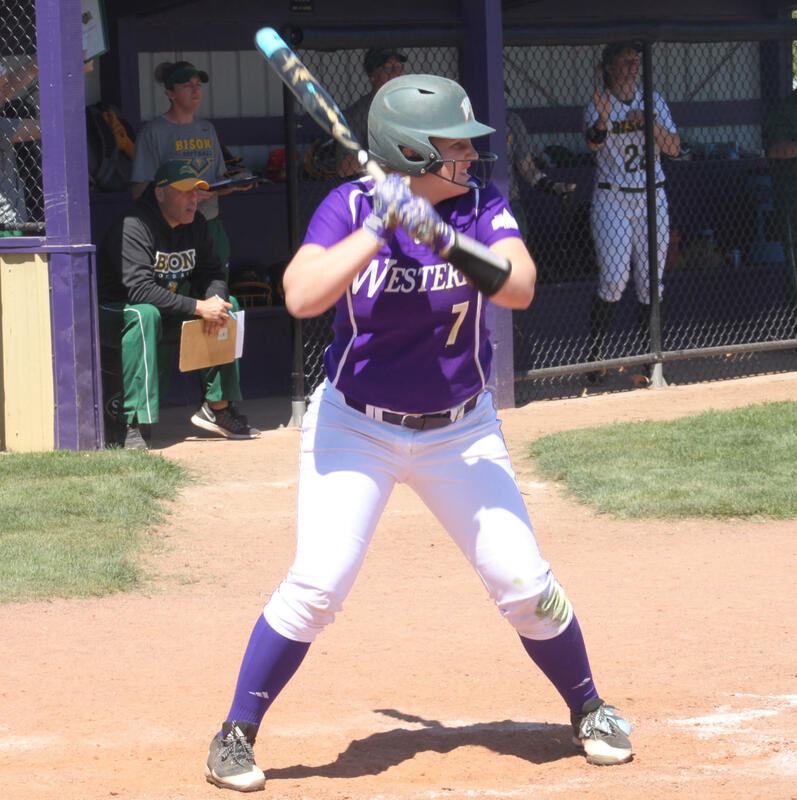 – The Western Illinois softball team started their quest for the Summit League tournament this past weekend. They hit the road for the eighth time in a row this season and took on the University of South Dakota. The Leathernecks swept the Coyotes in a three-game series and move to 10-22 on the season and 3-0 in conference. USD is now 13-24 overall and 3-3 in the League. The first two games were played on Friday, in a double-header, where the Leathernecks swept the Coyotes. In game one of the series, the Purple and Gold came out on top with a score of 5-3. South Dakota came out with an early lead after a two-run home run was hit into right center field. Sophomore infielder Halle Hollatz and junior pitcher Emily Ira retaliated with back-to-back hits to begin the inning, unfortunately, the two were left stranded and the Coyotes kept the lead. In the fifth inning, Western Illinois found their momentum after Kelsey Marlow doubled to right field with the bases loaded. Junior infielder Hailey Duwa then came up to bat and hit her second home run of the season giving the Leathernecks a lead of 5-2. During the bottom of the sixth, the USD catcher Jessica Rogers hit her second home run of the game to put them at a 5-3 deficit. The Purple and Gold held the Coyotes, and handed them their first conference loss of the season. Western Illinois came out victorious in game two of the double-header as well, winning by a score of 7-4. In total, the Leathernecks had 15 hits on the game and pitcher Payton Abbott stunned the Coyotes in the circle. She pitched 4.2 innings and struck out six players. “I am really proud of Payton (Abbott). I like to call her our ‘closer’ or ‘saver.’ I never think twice about putting her in, no matter what is happening. I have the upmost confidence in her,” said head coach Beth Golitko. Sophomore catcher Sydney Hollings had her first at bat of the season and tripled to right field bringing Hollatz to home plate. Later in the game, she impressed again at the plate by doubling as leadoff in the sixth inning. The third game of the series was set for Saturday, with the first pitch starting at 1 p.m. After a wind delay, the game finally started just after 3 p.m. The Leathernecks came out with the same intensity they had the day before and defeated the Coyotes 20-12. The first two innings were a close battle between the two teams. However, a six-run rally in the top on the third inning was where Western started to take the lead. South Dakota then turned around and brought in seven runs in the bottom of the fourth, leaving the score at 12-10, with USD leading in the fifth inning. The Purple and Gold were not at all discouraged by this. With five runs in the sixth inning and another four runs in the seventh, they would eventually take the sweep. Western Illinois is currently sitting atop the Summit League standings with their winning record. South Dakota was bumped to third in the standings after this weekend. Next up for the Leathernecks is another conference matchup against Indiana University-Purdue University Fort Wayne. This will be the home opener for Western and first pitch is set for Saturday, April 7, at 12 p.m.